Walking is the nearest activity to perfect exercise (Morris & Hardman, 1997). When thinking of exercise, most people think of heavier activities like running, but did you know that walking can be just as effective as running? (when done correctly). Brisk walking, which is walking at an increased pace, or about 3 miles an hour gets your heart pumping faster, can help build stamina, burn excess calories and reduce the risk of heart disease and type 2 diabetes. Here are four reasons why you should put on your walking shoes! Walking is already one of the most popular physical activities in the world according to the Department for Transport, and it isn’t difficult to figure out why – It is open to everyone and can be done anywhere and anytime! For most people, walking is as easy as putting on a pair of shoes and heading out the door, and even at work, taking a break to walk briskly for 10 minutes every day can go a long way in fulfilling the recommended 150 minutes of physical activity per week. Walking is safe and it carries a low risk of injuries and accidents – when done correctly. Being conscious about other pedestrians, traffic lights and cyclists whilst walking on the road and walking without such distractions as looking at a mobile phone can help avoid unnecessary risks. To most people, walking sounds like a monotonous activity which does not change from one day to the next. To create a more versatile exercise out of walking, you can change the scenery by walking somewhere different like a park or nature reserve, increasing your pace as you go on, and setting new and interesting challenges for yourself regularly. The physical benefits of walking can also improve mental health. Regular walking has been shown to significantly improve mood, reduce anxiety and improve self- image (Department of Health, 2004). Being physically active can reduce the risk of depression by up to 30%, and staying active can help depressed people recover. Walking in groups has also been shown to improve mental health through a heightened sense of community and improved self-esteem. Incorporating walking into your daily routine is the best way to make walking a habit and reap the benefits of it. Making daily decisions like walking instead of taking the bus or driving for short distances and taking the stairs instead of the lift can help you achieve this. Also, engaging the help of mobile applications like the FREE Active 10 app can make tracking the walking you do much easier. Active 10 is a FREE app developed by Public Health England and is the first free app to show you when you are walking quickly and long enough to get health benefits. The app shows you how much walking you do each day and how much of this is brisk walking. You can then see when you could possibly pick up your pace a little to get more ‘Active 10s’. 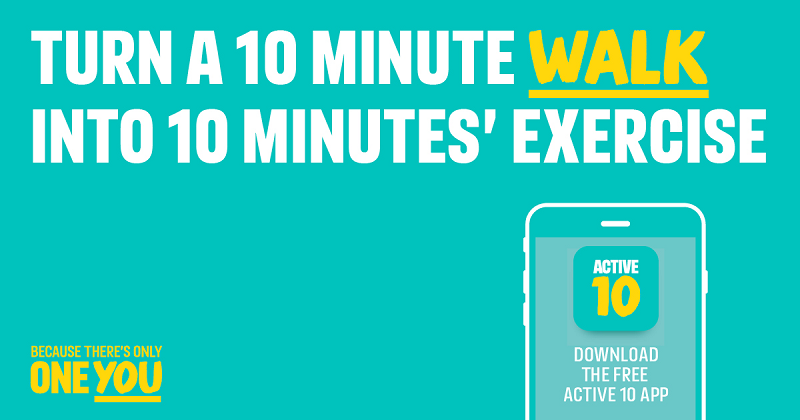 The app will tell you once you have achieved an ‘Active 10’, which is 10 continuous minutes of brisk walking. You can find the Active 10 app on our ‘Move More’ page. One You Hounslow has a number of FREE health walks every week which can also be found on our health walks page.